Groningen; Cycling City of the Netherlands? “Groningen is a real cycling city. No less than 60% of all traffic movements is by bicycle. This makes us proud. To keep it this way we want to give the bicycle more space in the years to come.” This is a small excerpt of why the city of Groningen feels it should become Cycling City of The Netherlands in 2016. That “in the years to come” is an interesting addition. This competition is about the state of cycling now and so the question is: is Groningen great at this moment? After my visit to the city I must say that I do not think so. The municipalities of Goes, Groningen, Maastricht, Nijmegen and Utrecht are the finalists in the Fietsstad 2016 competition for which the overall theme is “Bikenomics”. The Cyclists’ Union in the Netherlands regularly organises a competition in which municipalities can try to become Cycling City of The Netherlands. The last city to win the title was Zwolle (2014), which followed ´s-Hertogenbosch (2011), Houten (2008), Groningen (2002) and Veenendaal (2000). Before 2011 municipalities were chosen on the basis of the results of a cycling quality investigation by the Cyclists’ Union. From the 2011 election on municipalities have to enter the competition themselves. The 5 finalists were chosen by a jury on the basis of the written motivation, the policies and the figures about mode share, traffic safety and the type of cycling infrastructure in a municipality. On my blog I feature a video portrait of each of the 5 candidate municipalities. I publish these posts every other week, leading up to the announcement of the winner on 19 May 2016. The expectations I had of Groningen were very high. Like many of you I had read very positive stories about the city in English language articles from visitors of both the UK and the US. Unlike the editors of those articles I looked at the city with Dutch eyes, knowing what is going on in many other cities of the Netherlands. It was also a ‘fresh look’; I hadn’t been in Groningen for at least 15 years. Mainly because it is an over 3 hour journey away from my home. For that reason I spent a night in a hotel and that gave me plenty of time to ride around the city on a rental bicycle. 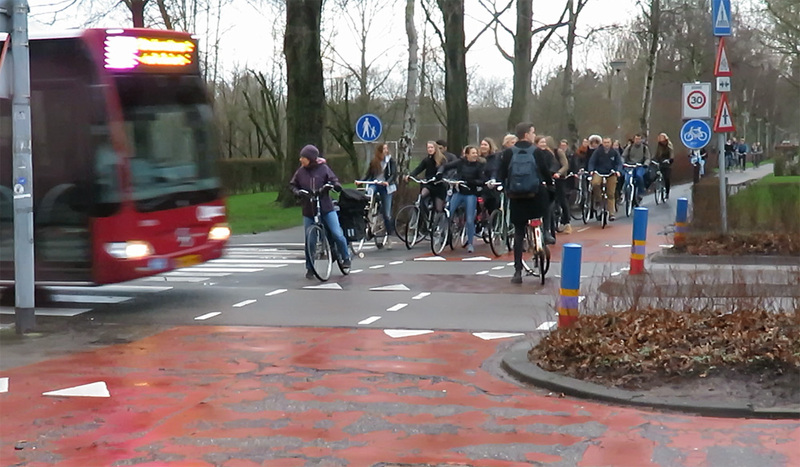 Cycling in Groningen is all too often shared with motor traffic. I really wondered why streets like this one are not yet designed as cycle streets. Naturally cycling is easy in Groningen. Most of the basic features of Dutch cycling infrastructure can be found there. That modal share of 60% is very high, but that is not the only criterion for this competition. We should also consider that there are 30,000 students in this very compact city of 200,000 people, a very good population structure for cycling. The compactness of the city makes distances almost always short. Good points are the parking facilities at the main station. The covered ‘City Balcony’ (Stadsbalkon) and the other facilities give room to park about 10,000 bicycles and there weren’t many racks empty. To spread the parking load a bit, the city has rebuilt the suburb station of Europapark. You can now find a very good parking facility there too. Without double stacked racks yet, which means that the facility can be expanded to double the 700 parking spaces in future. But Groningen doesn’t rise above average with such facilities in my opinion. 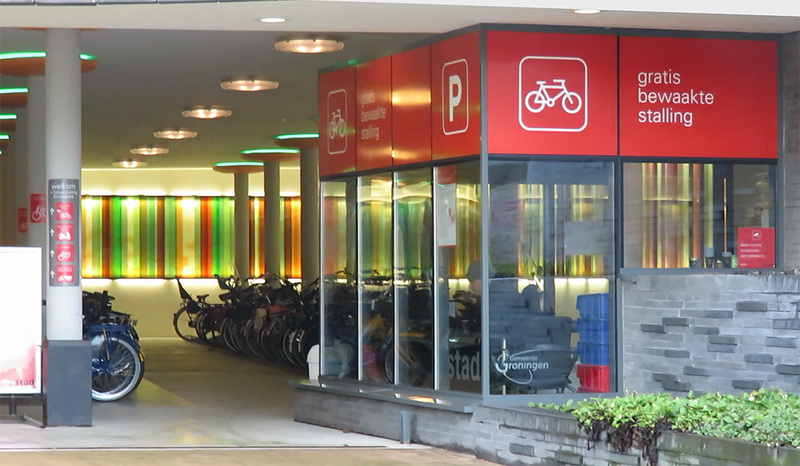 Huge bicycle parking facilities can be found all over the country now, some much more aesthetically pleasing than the concrete deck which the ‘City Balcony’ effectively is. The beautiful new underground bicycle parking facility at the Europapark Railway Station. At the moment room to park 700 bicycles, this can be raised to 1,500 when double stacked racks would be installed here later. Groningen is very proud of its “all directions green intersections”. With the city of Enschede they claim to have invented them. As I have written before: these intersections don’t impress me at all. Having cycled on such intersections again now I can only confirm how much I dislike people coming at me from all directions and never having a carefree passage. I almost get the feeling this feature is only there to disguise the fact that Groningen has almost no protected intersections. The green phase to give cycling an all-directions-green-time prolongs the total signal cycle, but – apparently to decrease the nuisance for other road users – the green time is kept as short as possible (seconds only). This in turn leads to the fact that you will find a red signal at almost every intersection you arrive at. In my opinion the alleged advantage that turning left does not have to take place in two stages is completely negated by that fact. An “all directions green” intersection in Groningen. In just a few seconds people have to traverse this huge area of asphalt, hindered by people going in different directions. And there was more I disliked: the overall state of maintenance of the cycling infrastructure is below average. Especially compared to Goes, one of the other finalists, the surfaces are just not good enough. Unfortunately the Groningen Cycling Strategy for 2015-2025 doesn’t mention a plan to improve it, on the contrary; it claims the surfaces are all smooth red asphalt. A bus / bike conflict at the canal ring. The main cycle route is straight-on (which is invisible on the street) while the main route for motor traffic makes a sharp turn. I felt very uncomfortable cycling here in the same direction as the men in this picture do. In 1977, Groningen was well ahead of its time when the so-called Traffic Circulation Plan for the city centre came into effect. It divided that city centre in four compartments. Private motor traffic could only go from one compartment to the other via a ring road. But that so-called canal ring did not get any cycling infrastructure. Motor traffic drives pretty fast there and in multiple lanes. I was glad to read that the city wants to improve the canal ring for cycling, but that only confirms the current situation is less than desirable. Nowadays most cities in the Netherlands have a car free city centre, or at least a centre around which most motor traffic is diverted. What was very strange to notice in Groningen is the fact that full-sized buses, even articulated buses, go right through the narrow streets of the old city centre. Bus/bike conflicts are the worst, because of the enormous difference in mass and speed. Just watching these interactions made me cringe several times. It is good to hear that just last week the council decided to phase out the buses from the city centre. Alas, only from 2018 on! So the dangerous bus/bike conflicts will continue to exist for quite some time. This intersection in Groningen is so unusual that there are indications which way to look. “Look left” at this location. The crossing of the route to the university area Zernike with Eikenlaan. A crossing that was obviously not designed to handle the more than 17,000 people passing here on their bicycle every day. Two years ago the city created an alternative route to the University Campus Zernike. The route has fewer signalised intersections than the main route and runs mostly away from motor traffic. In just a short time it has become a very well-used route that sees more than 17,000 riders per day. But this leads to problems. Some of the cycle paths in this route are really not designed for that traffic volume. That also goes for the crossing of Eikenlaan. I spent some time observing that crossing during the evening rush hour and I filmed a number of downright dangerous traffic situations. (Some of which are shown in my video below, from the 3:50 to the 4:08 minute mark.) It was good to read the city acknowledges this fact. The program of measures to be taken (the “Uitvoeringsprogramma 2015-2025”) mentions that already in 2014 the council decided that this crossing should become a “cycle zebra crossing”, which implies priority for cycling. Great, but apparently the reconstruction has not taken place yet. So again, this is something for the future. Korreweg today, with one-way protected cycleways on either side of the street. The city wants to remove these cycleways and turn the street into a cycle street; one roadway where motor traffic and cycling share the space, but with priority for cycling. 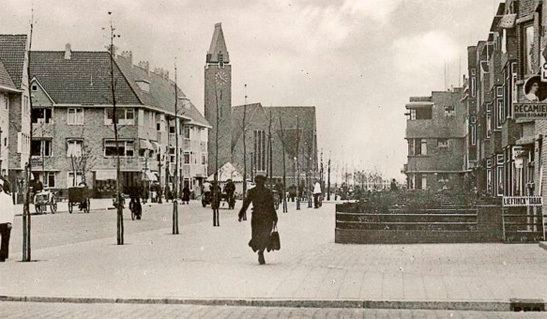 Korreweg at the same location long ago. This is how the city would like to see the street again, with more space for people walking and cycling. 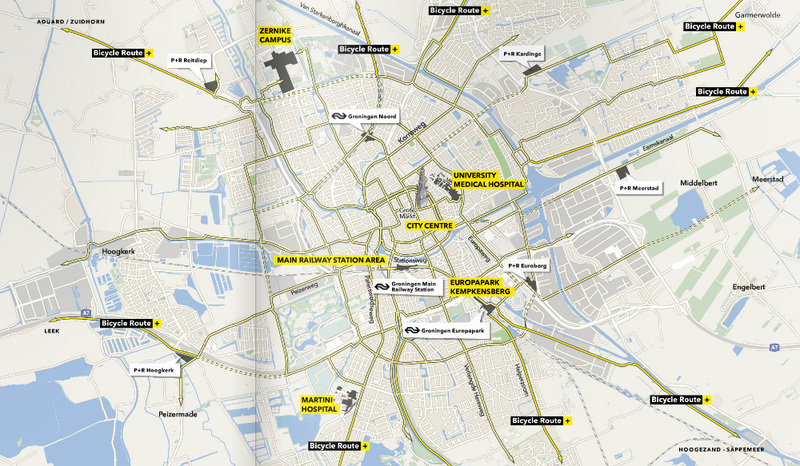 What was strange to notice, is that Groningen has only very few roundabouts. The only one I found was also not designed according to the latest design recommendations. The city apparently has no cycle streets yet either. Many of the streets in the city centre would benefit a lot from being redesigned as cycle streets. Drivers of motor vehicles, although a minority, still behaved as if they owned the black asphalt in these streets. But the city has other plans. It wants to build a cycle street in Korreweg. A street that has protected cycleways on either side of the roadway now. The city wants to remove these cycleways (!) and have motor traffic and cycling in the same space. That would then be a cycle street with red asphalt where cycling has priority. This is marketed as ‘giving cycling more space’. I find that odd, but it is an interesting development that I do not know any other examples of. It might turn out to be a good plan, but again, this is a plan, not something that exists today. 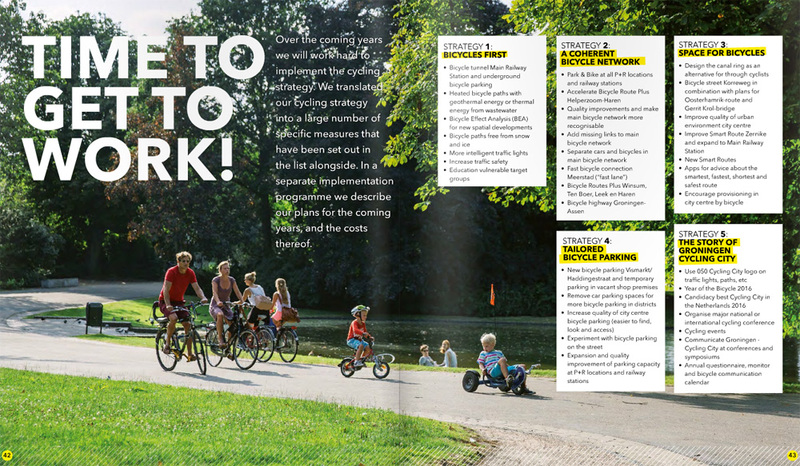 “Time to get to work!”, is the conclusion in the Cycling Strategy of the city of Groningen for 2015-2025. I couldn’t agree more! Becoming Cycling City of The Netherlands 2016 is about the cycling situation today. What I saw in the streets of Groningen now is in no way nearly as good as what I saw in the other finalist cities. Yes, Groningen was ahead of its time long ago, and yes, it has won the title before (2002), but other municipalities caught up with Groningen and some even overtook it. I am very glad to see that the city has plans to catch up in turn, but it will take a while before we see these plans materialise in the streets. In five years’ time the situation can be completely different again, but for this year’s competition Groningen is in my personal opinion simply not good enough to win the title. My video portrait of Groningen. Excellent piece on my hometown, Mark! Because I don’t own a car, I have pedalled a lot of kilometers on my bike in several Dutch and German cities (and in Groningen, obviously). Recently I biked a week in Barcelona by the way, but let’s not put that city in comparison with Dutch cities… It’s not that bad here in the Netherlands. The things you point out in this little article are correct in my opinion. The Diepenring (the ringroad around the medieval city) is a big problem for cyclists: not only is cycling along it very unpleasant, but crossing it (at the Ebbingestraat, Boteringestraat, W. A. Scholtenstraat etc.) is also a problem. Many times one has to wait in the shadow of huge double-articulated buses for the lights to turn green. In the evenings, the Ebbingestraat becomes a racetrack for cars and taxi’s by the way. 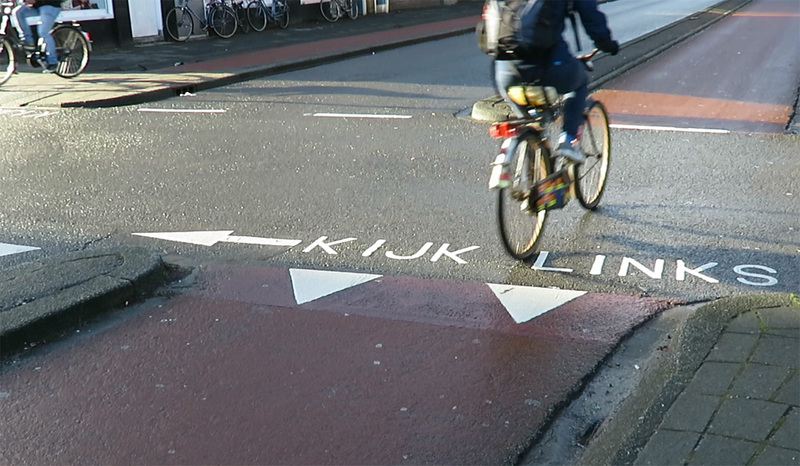 The “kijk links/look left” markings are ridiculous. This is one of the most dangerous crossings in the whole of the country, and what does Groningen do to improve the situation? Add a liter of paint. Ridiculous, it’s a solution one usually only sees in the UK. There are indeed plans to make the medieval city partially car and busfree, but people are already complaining about these ideas. My guess is that a complety carfree medieval city will be a dream for years to come. This is very unfortunate, because particularly the very narrow streets around the Grote Markt are totally unfit for combined bus and bike traffic. -The same goes for the Boterdiep, one can even say that the new parking situation for cars is more dangerous. A opportunity to create a seperate cyclingpath here has been sorely missed. – The medieval city is always full of weirdly parked trucks, vans and cars, creating dangers for cyclists and pedestrians. Anyway, thanks for pointing out these things on your blog! If Groningen doesn’t change things for its cycling population in a fast and smart manner, it will not catch up with the rest of the Netherlands. It’s kind of weird to think that a city can become this far behind with the rest in only a decade and a half. Maybe it is the “Law of the handicap of a head start”? People saying the bike is still king in Groningen are right, lets keep it that way. Things can change for the worst much faster than people think. I cycle along the Oostersingel and Boterdiep on a daily basis and I find it’s a lot more comfortable lately. However, i’ll fully acknowledge that might have something to do with less traffic due to all the construction. They were actually supposed to re-asphalt the Boterdiep’s cycling path after the Christmas break but then we had that week of severe black ice everywhere and I guess they postponed it (perhaps until the entire boulevard has been finished?). I believe similar plans have been made for the Oostersingel. Neither are supposed to be segregated though, just asphalt. The only thing I dislike about both streets now is the ridiculous drainage! It’s slightly tilted which causes the rain to pool on the cycle paths until the meters-long puddles are ‘deep’ enough to go over the small ridge and into the sewer. You’re right, the puddles formed there after a lot of rain are quite annoying! Fortunately it stopped raining now. And I like that I live in a country full of complainers and “this could and should be better!”-shouters. Without that, and city councils actually listening to people, things would improve much slower than they do now. Hopefully, Groningen will again make a big sprint forward in the future, and be a serious candidate for Cycling City in a couple of years. Because this year I don’t think they deserve to win it. riding my bike in Groningen but the work is never done, you hear, City Council? I never cycle there myself anymore (I used to cycle from the Oostersluis to the Albert Heijn a lot, but I don’t live in that neighbourhood anymore), but I remember that the cyclepath there is quite narrow indeed, and very busy at times. I hope all the new plans for the medieval city (Binnenstad), Main Station, etc. don’t cause a delay to the upkeep and renovation of cyclepaths in the rest of the city. They are equally important! I am a cyclist here in Vancouver, Washington, not far from Portland, Oregon. I am constantly amazed at the videos you put out. 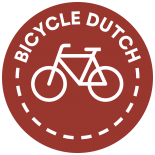 Portland is know as one of the most bicycle friendly cities but we pale in comparison with Dutch cities. As a teacher, I show occasional videos from this site and the students are amazed at the fabulous cycling system you have created. The bike garages really impress them. Thanks. I usually find these articles and films very informative, but I feel you missed out on a lot of stuff for Groningen. I’ve lived here for about 8 years now (came for university, never left) and the only mode of transport I have are my legs and bicycle. No need for a car. As a matter of fact, the inner city is practically car-free. One would almost say it’s by design, but obviously it’s not. However, the roundabout way for cars to navigate the city center deters drivers from doing so unless absolutely necessary. In your film it looks rather busy because you probably chose the moments with cars on purpose, but in my experience you rarely encounter cars in the city center on any given day. Buses can be a nuisance if you let them (and perhaps if you’re unused to them), but as long as you use your eyes, ears and common sense any altercations can be entirely avoided. There was one moment in the film where a guy went onto the sidewalk with his bicycle to avoid an oncoming bus; he was in the wrong here, as it’s a one-way street, even for bicycles. Most, if not all, streets in the city center are one-way and the really small ones are one-way for all traffic. And if you do go down them in the correct way, then you rarely have a bus behind you and if that happens to be the case, the bus driver keeps a (minimal, granted) distance. I’ve never felt threatened. However, there are plans to make the city center totally car *and* bus free, because of, among others, the issues you mentioned. It’s a shame you didn’t expand on that. Personally, I think it’s a bad idea, because of how many people use the buses and stops in the city center, but that’s a whole different story. As for the green cycles, they’re fabulous! Many (in and around the city center) have sensors in the front white line on the cycle path to ensure waiting cyclists get a green cycle ahead of other motorized traffic. If no one is on the cycle paths (or the first person in line doesn’t touch the white line with their wheel) then the traffic lights will keep their normal routine, which is usually 2 green cycles per round, so to speak. Personally, I don’t think the green cycles are too short, except maybe on the (Verlengde) Hereweg (outside city center) in rush hour because you can often get queues of 100+ people per traffic light. Which is why I avoid this road and instead cycle along the Helperzoom, which is parallel to it and much quieter and without traffic lights (just one long stretch of cycle path with priority for the cyclists). I’ve never had a run-in with anyone during a green cycle (or anywhere in this city, to be honest), because you anticipate each other’s pace, sometimes signal (to go first or which direction) and navigate. I’ve never seen two or more people run into each other either and I pass a lot of busy cycle paths. Tourists often screw up though, but most “Stadjers” (people of Groningen) can compensate and/or avoid. Also, a lot of busy intersections have humidity/temperature sensors which means if it’s wet (rain or snow) or cold, the cyclists get more green cycles! The condition of most cycle paths is fine, although there are a few that can use an upgrade, like the ones on the Zernike route. You’re right about that one roundabout: it’s horrid and needs new asphalt and a clearer (or segregated) cycle path. But I’ve never had any accidents there or anything like that. I don’t know when this was filmed but some of the streets on the outer edge of the city center and just beyond the canal ring are being upgraded at the moment, including the road along the University Medical Center Groningen (think: new asphalt, sidewalks, drains, wider cycle paths, parking spots on sidewalk instead of the road to avoid the need for segregated cycle paths, but also more car-free zones). Overall though, it’s like someone else said: the bike is king in Groningen. For a more thorough explanation on cycling, cycle paths and planning in Groningen you should check out: What can Seattle learn from Dutch street design? from UniversityGreenways on YT (https://www.youtube.com/watch?v=l0GA901oGe4). It’s from 2013, so some things have changed but I think there’s interesting information for those who are interested in how the city plans cycle paths, different traffic zones and whatnot. As another Stadjer, I totally agree with you. Maybe we, import Notherners are of more sterner stuff than the Southerners 🙂 (sorry Mark) . However , there is always room for improvement . The crossing Hanzeplein/Petrus Campersingel for intstance. There , pedestrians have green at the same time as the cyclists.Not good! But overall, I feel pretty safe cycling in Groningen. I’m sorry to say, but I think Mark has described the situation pretty well. He explicitly mentions future plans for improvement, but these are only plans, and he’s judging the current situation. And you can say that you don’t feel threatened by a bus just a few meters behind you; well, one could say the same when cycling on bus lanes in e.g. London (I’ve lived there, done so), but doesn’t make it great infrastructure. And to be honest, having many one-way streets even for cyclists in The Netherlands?!? So I think that the judgement that Groningen does not currently (not talking about past or future) live up to expectations for becoming Fietsstad 2016 is completely fair. There’s no need to apologize. I never claimed Groningen should or shouldn’t be granted the honor of Fietsstad 2016 – I don’t have enough experience cycling in the other nominated cities to judge. I merely pointed out that the review of the city was rather lacking pertinent information of the current situation, which I find unusual considering previous reviews and videos that are far more thorough. As for your comment about one-way streets; I’m not sure what you’re trying to say here. 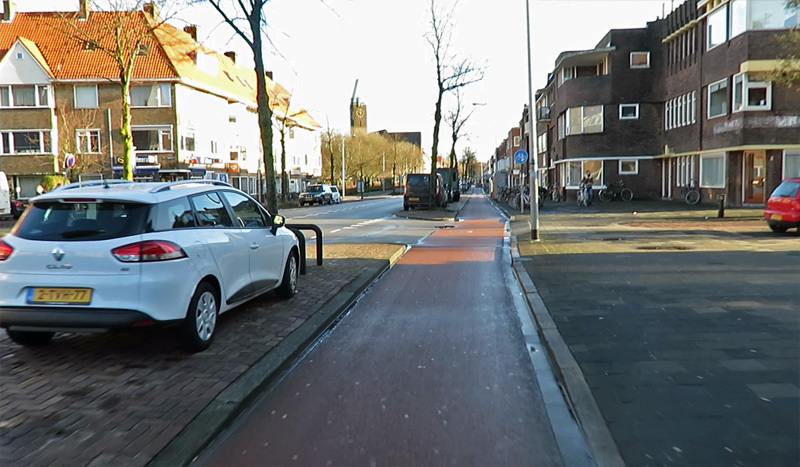 It’s pretty standard for cyclists to be excepted from one-way streets in the Netherlands (there’ll be a sign saying “uitgezonderd (brom)fietsers”), which is why I mentioned that the small streets downtown which are used by buses are in fact one-way streets even for cyclists. I was trying to make the point that one-way streets, indeed, cyclists are nearly always exempted. Thus the fact that there are various ones in the city centre of Groningen where this is not the case strikes me as not so great cycling provisions (for Dutch standards of course). P.S. I’m Dutch, and I have visited Groningen many times, although I haven’t cycled there often. Since this posting from Mark I rode my bike around town while trying to see through his eyes. And so I acquired a more critical view on the bike facilities and state of (un)repair on some streets. I also have the feeling that there is more motorized traffic around us here than there used to be. I don’t know if that is really so or just my perception. Still feel safe but Groningen does not deserve to be Fietsstad of 2016. But I already said that in an earlier reply. Thank you for this report. I am a regular pedastrian in Amsterdam and Utrecht, and cycle daily in Utrecht. When I visited Groningen in 2014 (as a pedestrian), I was shocked. It was long ago that I felt this unsafe in traffic in any city. Very unclear crossings and intersections. Hardly any seperation of moded of traffic. Lots of conflitcs, and it was the most assertive people had their way. Probably bad for the elderly, children and impaired people. Hardly saw them. The car and bus traffic in the city center baffled me as well. Being used to Amsterdam and Utrecht – both far from perfect, but busy improving their standing – it felt like stepping into the past. Can’t judge the simultaneous green cycles. They looked okay, but I can see problems there for vulnerable cyclists (children, elderly, etc). I am a sixty-one-year old woman who has been living in Groningen for about forty years and I love cycling in Groningen, love the simultaneous green cycles, love everything they have done to make cycling easier. There is room for improvement, I agree, but I remember the “bad old days” when the car was king and cars were circling around the central square in the city (Grote Markt), so I am glad things are as they are today. Thank you for your reply, it’s good to hear more from people that have experience on the ground. So if even with less-than-optimal infrastructure, Groningen is at a mode share of 60% for biking, I wonder how high it could be after some of things you pointed out have been improved. 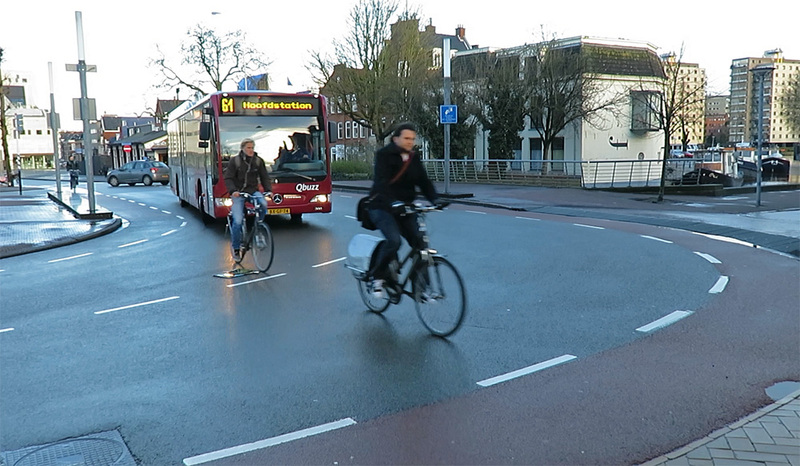 Seeing those buses bearing down on the cyclists looks more like a scene here in the UK than in the Netherlands! Interesting to read a critical review of cycling infrastructure of my old hometown. As far as I can judge, I would say that your account is pretty accurate :). – a problem concerning the Korreweg is that during rush hour, the path doesn’t have a sufficient capacity (one of the busiest cycle routes in Groningen, as far as I know). Personally I don’t enjoy cycling there due to that, too much conflict. Probably this is the main incentive behind the cycle street plans. I really wonder though how a “fietsstraat” will turn out, as currently the street is a local bus route as well as a significant route for car traffic (it might be that car traffic will be diverted to the current bus-only Oosterhamrikbaan). I believe there to be a number of mistakes by Groningen. The priority of the cyclists on roundabouts is quite dangerous. And the city has the statistically most dangerous intersection in the Netherlands. That is not good! Also, I wonder what the volume is on those proposed cycle streets? Are there enough cyclists and few enough cars? Also, I suggest staying perhaps a few weeks in Groningen passing by some simultaneous green junctions each day and see how they are. It takes time to get used to them. Assen also avoids conflicts with pedestrians in their versions of simultaneous green junctions, and tend to have more time for cyclists in the cycle timings. I have a few other questions about road policy in the Netherlands. I would like to know how many lanes and how wide those lanes are are used in the Netherlands for different configurations. When I look at plans for my own city for new 60 km/h arterial roads, they usually have a 3.7 metre wide inner lane and a 4.2 metre wide curbside lane, among other features. Those are very wide lanes, wider than 130 km/h limited motorways. The justification I hear for the 4.2 metre wide lanes is to provide a space for vehicular cyclists, but that doesn’t make any sense given that a cycle path will easily handle a 35 km/h cyclist with dropped handlebars on a well designed path. The number of lanes is interesting. A road near me was widened from 2 lanes to 4 with a median last year, with a volume of 20 thousand vehicles per day. I don’t know whether this was a justifiable widening or not, because I don’t know how the Dutch would have known whether to widen or not. Another thing I want to know about is how do the Dutch decide what kind of junction to use on the different kinds of roads? When do I know that a roundabout will work better than a traffic light? I have a general idea, 1500 PCU/h on the busiest arm, but I believe that requires even spreads of turning movements. If anyone has a copy of the Dutch guidebooks (translating to English please), and could tell me these 3 kinds of things, that would be excellent, because then I could better know what to advocate for where. 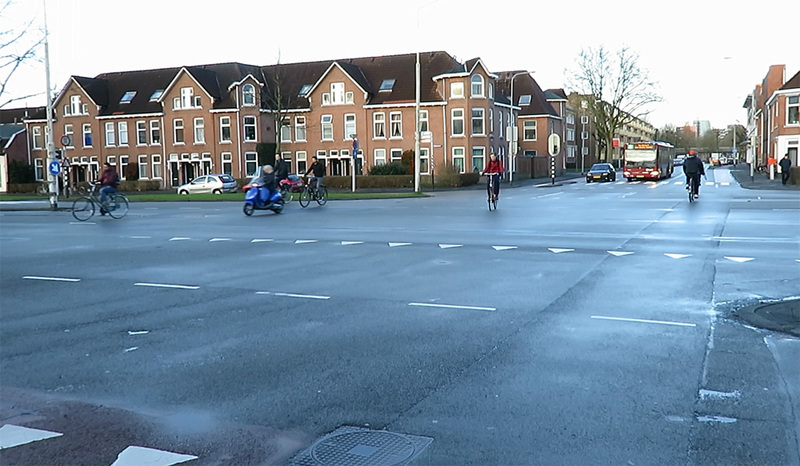 Priority on roundabouts for bicycles is the norm in NL, inside the city limits that is. 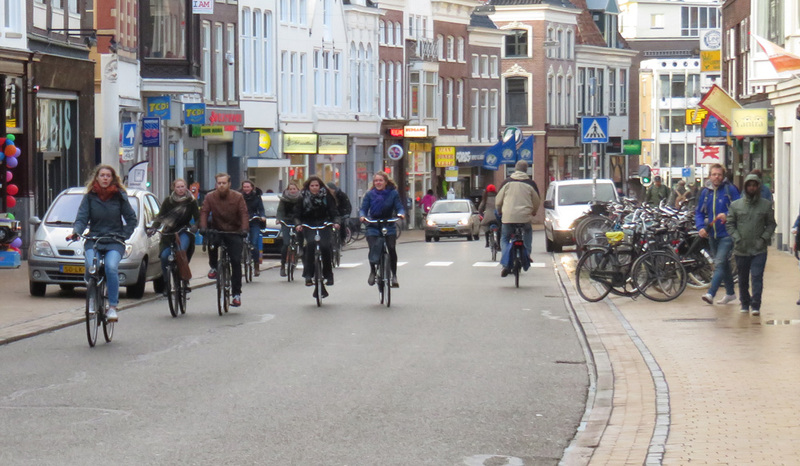 About enough critical mass: there are so many bikes in Groningen that most streets are de facto bicycle streets. I’ve never felt threatened by cars or buses. The bike is king. This ‘most dangerous intersection in the Netherlands’ you undoubtedly have from David Hembrow (as well as that part about priority on roundabouts, that I also heartily disagree with, btw). It is however outdated information: the data he used are from 2007-2009, and only one recorded accident has happened on that intersection in 2010, none since then. Currently data are available over a much longer period (2007-2014, although it seems most data only goes until 2010 or 2011), and in that light it’s not even the most dangerous intersection in Groningen any more, than dishonor has been taken over by the intersection at https://goo.gl/maps/Awk6rTUPiPn with 15 injured people in 14 accidents (against 13 in 13 for Bloemdiep/Korreweg, all before 2011). The actual most dangerous intersection in the Netherlands (by the criterium used by the source David had) is a large traffic lights protected intersection in Hoorn (north of Amsterdam), https://goo.gl/maps/bbM9jLfzNSu. From 2007 to 2011 there were 21 accidents with injury, in total 27 people injured here, of which 1 died. Then both of the intersections that are dangerous must be redesigned to be safer. Why stop at one when you could do both? The Hoorn junction should probably have a turbo roundabout with a bicycle underpass, the road raised about 2 metres, cycle paths lowered by 1. I expect far fewer crashes after such a redesign. It has been a long time since the Groningen junction was written about, it could have been redesigned according to how sustainable safety advises. If it has and is crash free since 2010, then that would be a great result. I object to priority for bikes on annular cycle path roundabouts because they involve a lot of head swiveling, I’ve frequently had situations where I should have legal priority but the cars don’t give it, and even when I’ve had the setbacks like the Dutch roundabouts do, the way the curves are designed makes it very hard to predict the movement of the motorists, whether they will continue to circulate or exit. And I have to watch the entering traffic too, at a fairly bad angle and not at a walking pace speed, but at 30 km/h. I am less likely to be killed at that speed, but I still don’t want to crash in the first place. I also come from a North American perspective and I don’t trust drivers to be understanding of cycle priority roundabouts. And I use the ongelukken.staanhier.nl website to get the statistics. I see a lot of cyclists as the victims of crashes at cycle priority roundabouts and the most given reason is failure to give priority, so I have a feeling like we know why. This entry was posted on 8 March 2016 by Bicycle Dutch in Original posts and tagged Cyclists' Union (Fietsersbond), Fietsstad, Groningen.